Chicago Ends Week On A High Note - Even Wheat! 20/12/13 -- Soycomplex: Beans closed higher as a warm and dry forecast for Argentina prompted further fund buying despite the looming weekend and Christmas holiday period. The latest Commitment of Traders report shows funds increasing their net soybean long by almost 9,500 contracts for the week through to Tuesday, taking their net long position to in excess of 172k lots. 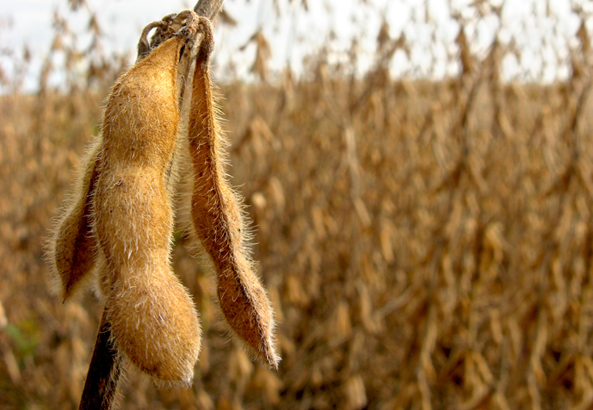 Funds were said to have been further net buyers of around 4,000 soybean contracts on the day. The weather forecast for Argentina is hot and dry for at least the week ahead. The Buenos Aires Grains Exchange pegged Argentina soybean planting at 77% complete as of Dec. 19, up from 66% a week previously. The Argentine Ministry estimate final plantings up 4% at 20.8 million hectares. Conditions in Brazil are generally favourable. Jan 14 Soybeans closed at $13.38, up 11 cents; Mar 14 Soybeans closed at $13.30 1/4, up 11 1/4 cents; Jan 14 Soybean Meal closed at $446.10, up $4.00; Jan 14 Soybean Oil closed at 39.43, up 10 points. For the week that puts Jan 14 beans 10 1/2 cents higher, with Jan 14 meal up $14.00 and Jan 14 oil down 39 points. Corn: The corn market closed around 3 cents firmer to end the week on ideas that heat and dryness in Argentina might lead to some production losses. The Buenos Aires Grains Exchange say that corn plantings in Argentina are 65% complete as of Dec. 19, up from 55% a week ago. The crop therefore isn't at the important pollination stage yet, which would hurt production potential if the heat wave continued until then. The Argentine Ministry see plantings down 6.5% to 5.7 million hectares this year. Reuters reported that China has rejected 545 TMT of US corn in the past month or so, in line with estimates from earlier in the week of 500-600 TMT. Ukraine said that it's corn harvest was all but done, and has topped the 30 MMT mark (easily a record volume). Russia said that it exported a record 589 TMT of corn in November, with South Korea (247 TMT) and Turkey (179 TMT) the main homes. The former is traditionally a big buyer of US corn. The USDA announced the sale of 180 TMT of US corn to Japan for 2014/15 under the daily reporting system. The Commitment of Traders report shows funds sitting on a net short in corn of almost 105k lots as of Tuesday night, an extension of the recent rally is possible if they continue to cover in this short ahead of the year-end. Mar 14 Corn closed at $4.34, up 3 1/2 cents; May 14 Corn closed at $4.42 1/4, up 3 3/4 cents. For the week Mar 14 corn was 13 1/2 cents higher. Wheat: Wheat managed to post rare gains in what might be considered pre-weekend profit-taking and a bit of light consolidation. Whilst the warm and dry pattern in Argentina may be of cause for concern for soybeans and corn, for wheat the crop is too advanced for it to make any difference to yields. Indeed, the dry and sunny conditions are helping to move the Argentine harvest on at a pace. Things are now seen 54% complete, producing a crop of 4.456 MMT to date. The Buenos Aires Grains Exchange again stood by their estimate for a wheat crop of 10.35 MMT. The Argentine Ministry have raised their forecast this week, but only to 9.0 MMT. The BAGE say that early yields in some of the more productive areas in SE Buenos Aires Province are proving to be "very good" - hence their optimism that final production will come in better than the current bare figures of less than 4.5 MMT off more than half the planted area would suggest. Fund money continues to build a short position in CBOT wheat, with the latest Commitment of Traders report showing them adding around 2,500 lots for the week through to Tuesday, to have them sitting on a net short of almost 72k contracts. Mar 14 CBOT Wheat closed at $6.13 1/2, up 2 3/4 cents; Mar 14 KCBT Wheat closed at $6.56 3/4, up 4 cents; Mar 14 MGEX Wheat closed at $6.51, up 4 3/4 cents. For the week CBOT wheat was down 4 3/4 cents, with KCBT down a quarter and MGEX up 8 3/4 cents. 20/12/13 -- EU grains closed mixed, in a continuation of the overall sideways pattern remains. That's more than can be said for US wheat, which seems to be stuck in terminal decline, despite a modest attempt to stage an end of week rally today. As of last night's closes Chicago wheat had fallen 6.8% so far this month, with Minneapolis wheat down 5.9%. 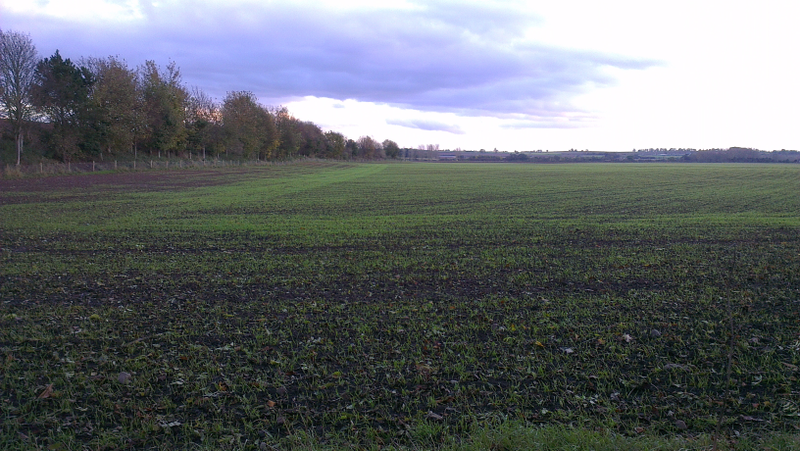 In contrast, both Paris and London wheat are actually marginally higher. Today's session ended with Jan 14 London wheat down GBP0.80/tonne at GBP164.70/tonne (correcting last night's close which was a bit false), whilst Mar 14 rose GBP0.50/tonne to GBP164.50/tonne. Jan 14 Paris milling wheat closed EUR2.25/tonne higher at EUR210.75/tonne, Feb 14 Paris rapeseed rose EUR1.00/tonne to EUR368.50/tonne, whilst Jan 14 Paris corn was down EUR0.50/tonne to EUR173.25/tonne. For the week that puts front month London wheat GBP0.70/tonne lower, with Paris wheat EUR2.25/tonne firmer, Paris rapeseed up EUR1.25/tonne and Paris corn down EUR2.50/tonne. Strong demand is what has been supporting European wheat. Brussels issued 818,455 MT of soft wheat export licences this past week, the second highest weekly total of the season so far. Cumulative EU-28 wheat exports now stand at 13.4 MMT versus 9.1 MMT a year ago, an increase of more than 47%. Lack of demand is being cited as negative for US wheat, although a glance at the same statistics across the pond reveals that the US has exported 18.3 MMT of wheat so far this season, an increase of almost 39% on only 13.2 MMT this time last year. There's not really that much difference there at the end of the day is there? Maybe the demise of Chicago wheat to 18-month lows, and what Reuters say will potentially be its biggest three-week loss in two years, owes much of its current misfortune to increased fund selling? This has really gathered momentum over the last 3-4 weeks, and last Friday's Commitment of Traders data shows them now sitting on the largest short position in CBOT wheat that they've had in at least the last 12 months. In fundamental news, Europe's 2014 wheat crop is in generally good shape, plantings are up a little, and early forecasts are for a small rise in output next year in the region of 2%. Plantings and production in America are estimated likely to be up more than that, with Informa earlier this week suggesting that all wheat output in the US could by up by almost 10% in 2014. The German Stats Office today said that winter wheat plantings there were up 2.5% to 3.13 million hectares, which is broadly in line with Toepfer's estimate of a rise of 3% to 3.22 million ha from earlier in the week. 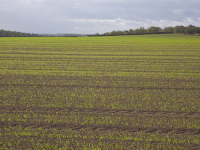 The Stats Office peg German barley plantings 2.7% higher at 1.24 million ha, with the OSR area falling 1.8% to 1.43 million ha. Ukraine said that it had now harvested more than 30 MMT of corn this year (easily a record volume), taking the 2014 grain harvest to 63.664 MMT - also a record. A wet autumn in the FSU means that winter grain plantings there are down, although plentiful soil moisture has helped crop conditions. The Ukraine Stats Office said that winter grains had been planted on 7.79 million hectares this year, a decline of 4% versus last year. Winter OSR has been planted on 953k ha, a drop of 7.6% versus 12 months ago. The Ministry say that 92% of winter crops are in good/satisfactory condition. Russian winter grain plantings meanwhile have only been achieved on around 93% of the area sown in 2012. Both countries are likely to plant significantly more corn in the spring on the extra land available, potentially beating this year's record FSU crop again in 2014. Russia said that it exported a record 589 TMT of corn last month, up 128% versus Nov 2012 and up 143% on the volume exported in October. 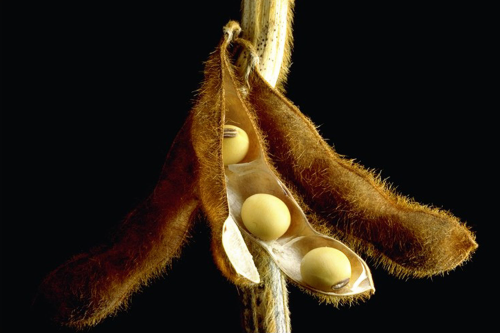 19/12/13 -- Soycomplex: Beans closed with modest gains despite weekly export sales of 415,500 MT – a marketing-year low - falling short of trade expectations for sales of 700-900 TMT. There were also sales of 80,200 MT of beans for 2014/15. Meal sales of 77,100 MT for 2013/14 were also a marketing-year low. Nevertheless, the sales pace of beans in particular has been frenetic since the beginning of the 2013/14 season. Weekly shipments are showing signs of tailing off a little, but this week's bean export total of over 1.5 MMT is still more than respectable. The US has now shipped 20.5 MMT of beans in 2013/14, and has another 18.5 MMT on the books waiting to go. That gives total commitments of 39 MMT against the USDA's target for the entire season of 40.1 MMT. That's 97% compared to last year’s 84% and the 5 year average of 73% at this time. Talk persists that some of these outstanding soybean sales to China won't get shipped. Only time will tell. Argentine weather looks a little less threatening today. "La Pampa in southwest Argentina was hit with strong thunderstorms overnight, receiving 1-2 inches of rainfall. A small area of northern Buenos Aires also received one inch of rain (25 mm). The new forecast calls for scattered showers here and there. Temperatures would continue hotter than normal however with highs in the 90's F," said Martell Crop Projections. Jan 14 Soybeans closed at $13.27, up 3 cents; Mar 14 Soybeans closed at $13.19, up 5 1/4 cents; Jan 14 Soybean Meal closed at $442.10, up $0.90; Jan 14 Soybean Oil closed at 39.33, up 27 points. Corn: The corn market finished with gains of around 5 cents on the day on fund buying/short covering approaching year end. Weekly export sales came in at a nice 827,100 MT, above trade expectations for sales of 550-750 TMT, and adding support. The USDA also separately reported sales of 130 TMT of US corn sold to South Korea for 2013/14 shipment, along with 111,280 MT for 2013/14 and 16,256 MT for 2014/15 delivery to unknown. Weekly corn shipments were 693,400 MT with China (245,500 MT) the top destination despite the current rejection problems due to around 30% of US cargoes being shipped to China said to contain traces of the non-approved MIR 162 variety. The Buenos Aires Exchange estimated Argentina’s corn planting at 62.5% complete versus 55.2% a week ago. Strategie Grains forecast the EU-28 corn crop at 64.7 MMT in 2014, a marginal 0.3% rise on this year's production. They foresee a 2.2 MMT decrease for Romania and Bulgaria and a net 2.4 MMT increase coming from France, Germany, Hungary and Italy. The USDA's FAS said that Bulgaria had exported over 1.3 MMT of corn so far this season, an increase of 1300% on this time last year. They see final 2013/14 Bulgarian corn exports at a record 1.9 MMT. This year's corn crop there was up more than 50% to 2.6 MMT. Eastern Europe and the FSU countries remain aggressive sellers of what has been a record corn crop for many in the region. Israel bought 95 TMT of optional origin corn in a tender, thought like to end up coming from the Black Sea. Mar 14 Corn closed at $4.30 1/2, up 5 1/2 cents; May 14 Corn closed at $4.38 1/2, up 5 cents. Wheat: Despite rising corn, wheat simply couldn't manage a rally closing lower on all three exchanges. Minneapolis wheat has now been lower every day since 9 Dec. Weekly export sales of 656,100 MT for delivery during the 2013/14 marketing year were up 76% from the previous week and 47% up from the previous 4-week average. Brazil took one cargo. That was also better than the modest market expectations of 300-500 TMT. There was a story on Reuters that one of Brazil's biggest flour mills has been told that it won't be getting the Argentine wheat it already has purchased for January delivery. Earlier in the week reports suggested that 1.6 MMT of 2013/14 Argentine wheat was still awaiting government approval to be shipped. CBH Group said that they expect this season's grain harvest in Western Australia to break all previous records. The company typically handles around 90% of the state's production, and has received 9.2 MMT of wheat, 3.5 MMT of barley and 1.7 MMT of canola to date, and grain is still coming in. They said that in the previous record year of 2011/12 deliveries were still being made up until February. Iraq bought 350 TMT of Australian wheat in a tender for Mar/Apr shipment. Australia's bumper crop, and Canada's record one are proving to be a thorn in the side for US wheat. Strategie Grains forecast the EU-28 all wheat crop in 2014/15 at 145.7 MMT, a 2% increase on this year. Mar 14 CBOT Wheat closed at $6.10 3/4, down 2 cents; Mar 14 KCBT Wheat closed at $6.52 3/4, down 1 cent; Mar 14 MGEX Wheat closed at $6.46 1/4, down 1/2 cent. 19/12/13 -- EU grains closed mixed, but mostly a bit firmer, following recent losses, but essentially we are still stuck in sideways trade. Jan 14 London wheat ended up GBP2.05/tonne at GBP165.50/tonne, although Mar 14 closed GBP0.30/tonne lower at GBP164.00/tonne. Jan 14 Paris wheat finished EUR1.00/tonne firmer at EUR208.50/tonne, Jan 14 Paris corn closed EUR0.75/tonne higher at EUR173.75/tonne, whilst Feb 14 Paris rapeseed jumped EUR6.25/tonne to EUR367.50/tonne. Defra revised their assessment of the 2013 UK wheat crop down from 12.1 MMT previously to only 11.9 MMT - the lowest output since 2001. That's a 10% decline on production in 2012, which itself was a very poor crop, despite a rise in yields of 11% due to a 19% weather enforced drop in plantings. The 2013 UK barley crop was pegged at 7.1 MMT, an increase of 28% on last year. The UK OSR crop estimate was unchanged from previously at 2.1 MMT, a 17% drop on a year ago. French analysts Strategie Grains estimated the EU-28 soft wheat crop 2% higher in 2014 at 138 MMT, with the all wheat crop also increasing 2% to 145.7 MMT. 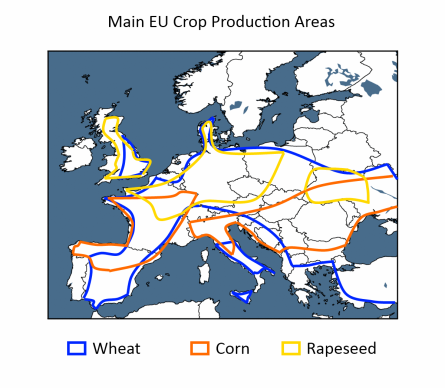 They see the 2014 EU-28 barley crop down 8% at 54.5 MMT, with corn output up marginally at 64.7 MMT. MDA CropCast forecast the 2014/15 EU-28 soft wheat crop at 138.53 MMT, up 630 TMT on a week ago. "Rains are beginning to build across western areas, and should increase further this week. 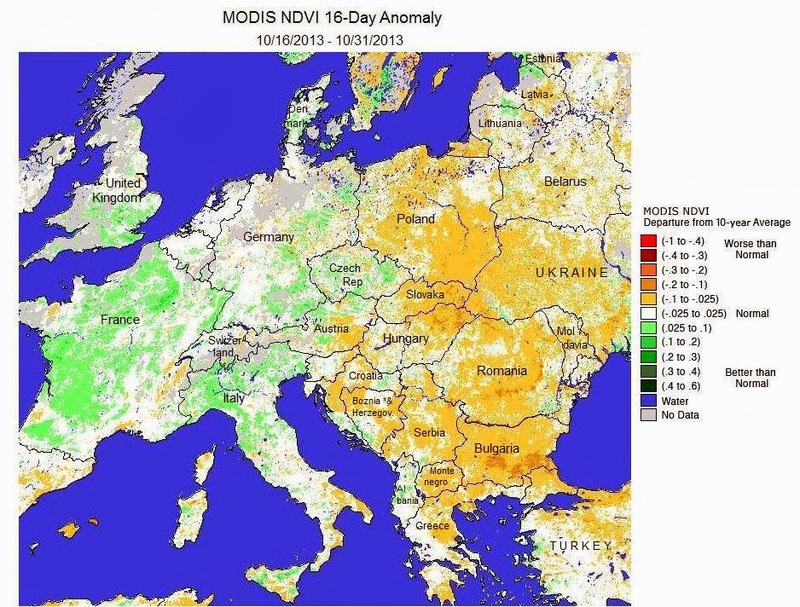 This will improve moisture, especially in Spain, France, U.K., and western Germany. However, snow cover will remain limited across the continent as temperatures remain rather mild. The lack of snow cover in eastern areas will make the wheat there more susceptible to winterkill during any future cold outbreaks. Also, moisture will decline in central and eastern areas as precipitation remains very limited," they said. Ukraine's 2013/14 grain exports of 16.4 MMT are up 24% versus a year go. Russia's are less robust at 14.3 MMT, a 15.5% increase versus 2012/13. Kazakhstan has exported 4 MMT of grain so far this season versus a government estimate of 9-10 MMT for the full marketing year. Iraq bought 350 TMT of Australian wheat in a tender today. CBH said that the Western Australian grain crop (including canola) would be a record this year, beating the previous all time high of 15.06 MMT set in 2011/12. WA is the main exporting state in the country. The USDA's FAS department in Bulgaria said the the country had exported 2.72 MMT of wheat so far this year, an increase of 57% versus a year ago. They estimate the the Eastern European country will export a record 3.1 MMT of wheat this year. Wheat plantings for 2014 are seen slightly lower than 1.19 million hectares this year at 1.1 milion ha. 18/12/13 -- Soycomplex: Beans closed sharply lower on fund selling, possibly linked to year-end profit-taking and long liquidation, and as weather forecasts for Argentina adopted a wetter look than yesterday. Chinese industry analysts forecast the country's soybean imports declining over the coming months. They see Dec bean imports at 6.65 MMT (unchanged from previously), falling to 5.8 MMT in January (but up from previous estimate of 5.6 MMT), followed by Feb imports of 4.8 MMT (up versus a previous estimate of 4.5 MMT), with March imports at 4.7 MMT (down from a previous estimate of 4.8-5.0 MMT). Celeres estimated Brazil’s 2013/14 soybean crop at 87.2 MMT, unchanged from previously, and although a record generally below other trade forecasts which centre around 88-90 MMT. Informa reduced slightly their estimate for US 2014 soybean plantings, down from the 83.8 million acres forecast last month to 81.93 million, although that's still a sharp increase on the 76.5 million said to have been planted this year. They have the 2014/15 US soybean crop estimated at a record 3.603 billion bushels, up 10.6% from 3.258 billion this year. Trade estimates for tomorrow's weekly export sales report for beans are 700,000-900,000 MT. Jan 14 Soybeans closed at $13.24, down 22 1/2 cents; Mar 14 Soybeans closed at $13.13 3/4, down 21 cents; Jan 14 Soybean Meal closed at $441.20, down $6.80; Jan 14 Soybean Oil closed at 39.06, down 25 points and the lowest close for a front month since July 2010. Corn: The corn market closed around 1-2 cents lower on a less threatening tone to the weather outlook in Argentina and a firmer US dollar after the Fed announced that they are to begin tapering QE. The ongoing, and so far showing little sign of getting resolved, dispute with China over MIR 162 corn in shipments from the US is also a bearish influence. Reuters reported that China has rejected "more than" 10 cargoes of US corn since mid-November. Bloomberg put the figure at "at least" 9 cargoes, so either way we are talking somewhere in the region of half a million tonnes or more. Buyers in Japan and South Korea are said to be holding off purchasing US corn in anticipation of picking up cheap "distressed" cargoes of rejected corn. The Energy Dept reported that US ethanol production fell to 928,000 barrels/day from 944,000 bpd the previous week. Informa estimated the 2014 US corn area at 91.846 million acres, up from a previous estimate of 91.5 million but behind the 95.3 million planted this year. They see production at 13.741 billion bushels, down only 1.8% from this year's record 13.989 billion. That's not such a large drop as you might have expected, and would potentially lead to a further significant build in US corn stocks in 2014/15 if true. Celeres estimated Brazil’s 2013/14 total corn crop at 75.6 MMT - far higher than the USDA's 70 MMT forecast. Weekly export sales for corn tomorrow are expected to come in at around 550-750 TMT. Last week's sales were 695 TMT. Mar 14 Corn closed at $4.25, down 1 3/4 cents; May 14 Corn closed at $4.33 1/2, down 1 3/4 cents. Wheat: Wheat slumped to fresh lows for this latest move, closing around 3-7 cents lower across the 3 exchanges. Jan 14 Chicago wheat posted the lowest close for a front month since June 2012 on the continuous chart for a second successive day. Informa estimated the US all wheat area for the 2014 harvest at 57.9 million acres, down slightly from a previous estimate of 58.105 million, but up 3% from the 2013 acreage of 56.16 million. They have US 2014/15 all wheat production estimated at 2.339 billion bushels, up almost 10% versus the 2013/14 estimate of 2.130 billion. Brazil are said to have bought 50 TMT of US HRW wheat for Jan shipment as "insurance" against Argentina blocking exports. A story on Reuters says that Argentina’s exporters are still waiting for the government to approve shipment of 1.6 MMT of 2013/14 wheat that's already been sold. The 2013/14 Argentine wheat harvest is around halfway through. Dr Cordonnier said that Rio Grande do Sul will be Brazil's largest wheat producing state this year with a crop of 2.9 MMT, a 56% increase on last year. Brazil's traditional leading producing state is Parana, but frost damage is likely to have cut their crop to around 1.8 MMT this year. Nevertheless, Conab forecast Brazil's national crop 22% higher in 2013/14 at 5.3 MMT. Trade estimates for tomorrow's weekly export sales report for wheat are around 300-500 TMT. Mar 14 CBOT Wheat closed at $6.12 3/4, down 7 cents; Mar 14 KCBT Wheat closed at $6.53 3/4, down 6 3/4 cents; Mar 14 MGEX Wheat closed at $6.46 3/4, down 3 1/4 cents. General: It now remains to be seen how the market reacts to the news that the Fed is to begin tapering QE. On the one hand, the news should be supportive for the US dollar, making it bearish as far as US exports are concerned. On the other though, the announced $10 billion cut is relatively modest in the overall scheme of things, so the difference to the markets could be negligible. 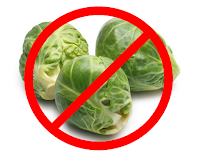 18/12/13 -- EU grains closed mostly lower, following Chicago wheat slumping to its lowest levels in 18 months. The session ended with Jan 14 London wheat down GBP0.55/tonne at GBP163.45/tonne, Jan 14 Paris wheat was EUR0.50/tonne easier at EUR207.50/tonne, Jan 14 Paris corn was down EUR0.50/tonne at EUR173.00/tonne and Feb 14 Paris rapeseed slumped EUR2.50/tonne to EUR361.25/tonne. As we head towards the year end we find that London wheat prices have fallen around 20% versus where we were on 31 Dec 2012. Paris wheat has dropped by a slightly more modest 17% during this time, compared to a decline of 21% in rapeseed values and a steep 38% fall in the price of corn. Whether things will improve, or simply continue to get worse, in 2014 remains to be seen. 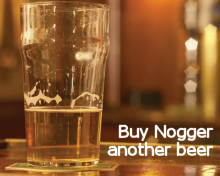 The question seems to be is the glass half full, or half empty. Historically these levels are still pretty good, except maybe only not so when looked at in the rear view mirror. If wheat prices were really that bad, then surely farmers would be planting less? 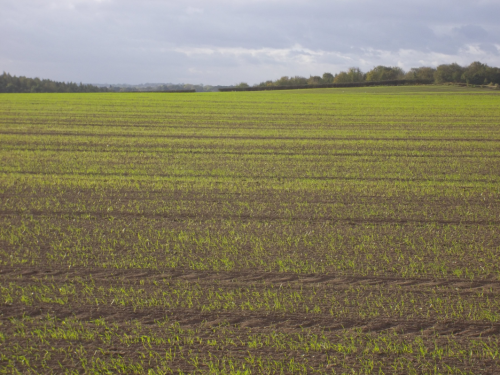 Toepfer said that Germany's winter wheat plantings are up 3% on last year at 3.22 million hectares, whilst barley plantings are unchanged and the OSR area is down almost 5% at 1.39 million ha. They said that Germany’s winter grain crops are generally in good condition. India's wheat plantings for the 2014 harvest were at 25.4 million hectares as of Dec 13, versus 22.8 million a year previously. European and US wheat plantings meanwhile are seen higher for 2014, and crop conditions are generally good and significantly better than a year ago. Canada has just brought in a record wheat harvest, and Australia's crop is generally higher than was expected. Dr Cordonnier reported that wheat output in Brazil's Rio Grande do Sul is up 56% this year, making it the leading producing state in the country. Conab put national production at 5.3 MMT, an increase of 22%. Ukraine said that it had exported 16.4 MMT of grains so far this marketing year (to Dec 13), an increase of 24% on a year ago. Wheat exports are up 14%, those of barley up 12% and corn shipments are 42% higher. Rusagrotrans said that Russia would exported 15.9 MMT of grains in the first half of 2013/14 (Jul/Dec), including 12.2 MMT of wheat. Decembers exports would fall to 2.0 MMT from 2.55 MMT last month, they said. They peg the 2013/14 grain harvest at 90.8-91.2 MMT in clean weight (70.7 MMT in 2012), with full season exports at 21.6 MMT versus 15.55 MMT a year ago. The market was a bit surprised that Russia won a share of yesterday's Egyptian tender, having become convinced that they were out of the quality wheat market until 2014. Romania also keeps squeezing out the odd cargo if the price is right, also confounding belief that they are just about sold out. 17/12/13 -- Soycomplex: Beans closed around 8-9 cents higher, on the nears at least, on talk of hot and dry conditions developing for Argentina over the next week to 10 days. It was a choppy day, with the overnight session trading lower, but at the finish Mar 14 beans posted their highest daily close since Sep 13. Soybean oil on the other hand is friendless, and the Jan 14 contract finished within 20 points of the lowest close for a front month since July 2010. Dr Cordonnier estimated Brazil’s 2013/14 soybean crop at 90.0 MMT, which is unchanged from his previous estimate and a record output. He has Argentina’s 2013/14 bean crop at 56.0 MMT, also unchanged from his previous estimate and also a record volume. Informa come out tomorrow mid-session with their 2014 US acreage estimate updates. For beans their previous estimate was 83.81 million acres, almost 10% higher than the estimated 76.5 million planted this year. There's continued speculation that China will cancel some US bean cargoes, but there's no sign of it yet. Indeed there's been gossip this week that they are sniffing for US beans for Feb and Mar shipment this week. Jan 14 Soybeans closed at $13.46 1/2, up 8 3/4 cents; Mar 14 Soybeans closed at $13.34 3/4, up 9 1/2 cents; Jan 14 Soybean Meal closed at $448.00, up $9.00; Jan 14 Soybean Oil closed at 39.31, down 44 points. Corn: The corn market closed with gains of around 3 cents on a warmer and drier outlook for South America in the week ahead. The USDA announced 278,384 MT of US corn sold to Japan for 2014/15 shipment. South Korea's KFA bought 65,000 MT of US corn for Jan shipment. Israel seeks 45,000 MT of optional origin corn. Iran bought 25,000 MT of Ukraine corn for Dec shipment. Dr Cordonnier estimated the 2013/14 Brazilian corn crop at 68.6 MMT, unchanged from his previous estimate. He pegged production in Argentina at 24.0 MMT, also unchanged from his previous estimate. South Korean buyers are said to have agreed to take 195 TMT of US corn shipments early (albeit at a reduced price) as quarantine problems getting US corn through Chinese customs continue. Informa are due to release their latest 2014 US planting estimates tomorrow. Last month they estimated the 2014 US corn area at 91.7 million, down almost 4% from the 95.3 million that was said to have been planted this year. Tomorrow will bring the regular ethanol production report from the Energy Dept. Output last week was 944,000 barrels/day - the highest production seen since January 2012 - as margins remain very strong. After that the trade will be looking to Thursday's weekly export sales report to see how international demand for US corn is faring in the face of strong competition from the Black Sea and South America. Mar 14 Corn closed at $4.26 3/4, up 3 1/2 cents; May 14 Corn closed at $4.35 1/4, up 3 1/2 cents. Wheat: The wheat market couldn't manage a rally, even if corn and beans could, closing with losses of around 2-5 cents across the three exchanges. Jan 14 Chicago wheat posted the lowest close for a front month since June 2012 on the continuous chart. US wheat missed out in the Egyptian tender, even though it was around $5 cheaper than French and $7 below the winning Romanian and Russian offers, due to freight considerations. Thank God then for Brazil. They imported 671 TMT of wheat in November and 501 TMT of that came from the US. Jan/Nov imports were 6.636 MMT (versus 6.154 MMT in 2012) and the US was the leading supplier, providing 3 MMT of that versus only 55 TMT in the same period in 2012. Argentina was relegated into second place, supplying 2.54 MMT versus 4.86 MMT in 2012. Iran are said to have bought around 250 TMT of Mexican durum wheat, along with 180 TMT of wheat from the Baltic as they take advantage of the recent relaxation of Western sanctions. Tunisia seek 134 TMT of optional origin durum wheat, 109 TMT of optional origin soft wheat, and 25 TMT of optional origin feed barley for Jan-Mar shipment. Jordan are tendering for 100 TMT of wheat for May-Jun shipment. Israel seeks 25 TMT of optional origin feed wheat, and 25 TMT of optional origin feed sorghum for Feb-Apr shipment. Informa are out with their latest forecast for the US wheat area for the 2014 harvest tomorrow. In November increased their forecast from the 57.7 million acres estimated in October to 58.1 million. That's a 1.9 millionacre, or 3.4%, rise versus the area sown for this year. Mar 14 CBOT Wheat closed at $6.19 3/4, down 2 cents; Mar 14 KCBT Wheat closed at $6.60 1/2, down 5 cents; Mar 14 MGEX Wheat closed at $6.50, down 4 1/4 cents. 17/12/13 -- EU grains closed mostly lower with Jan 14 London wheat ending down GBP0.30/tonne at GBP164.00/tonne whilst Jan 14 Paris milling wheat ended unchanged at EUR208.00/tonne. Feb 14 Paris rapeseed fell EUR2.75/tonne to EUR363.75/tonne, whilst Jan 14 Paris corn rose EUR1.00/tonne to EUR173.50/tonne. With the possible exception of the odd blip we are essentially still stuck in sideways trade. Demand for EU wheat remains strong, but global production is higher than it's ever been, and so to is that of corn. Few appear to have strong conviction as to whether 2014 will bring a re-assertion of negative influences driving prices to new lows, or if a new year might bring a renewed appetite for spec money to come flooding back in for grains. Currently the fundamentals would appear to edge on the side of generally lower prices to start 2014. The firmer euro might impede a continuation of the very strong early pace of EU wheat exports. News late in the day that Egypt had bought one cargo each of Russian and Romanian wheat, with French and German origin missing out may have disappointed that market. Cheaper Black Sea sellers appear to still have the ability to wring out the odd cargo and undercut the French into the world's largest wheat buyer when the chips are down. 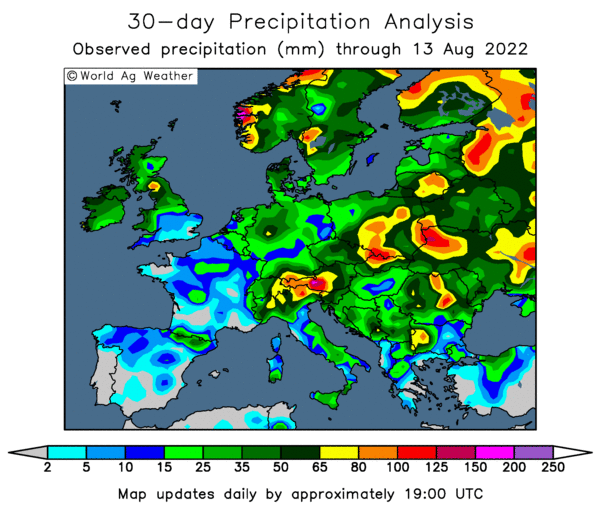 "Wheat prospects this season in Western Europe are much improved over last year, but in Eastern Europe conditions are worse. This analysis is based on vegetative growth October 16-31 obtained via remote satellite (click map to enlarge). "Autumn wheat development is very often a good indicator for the final crop yield. The top 3 wheat producing countries are located in Western Europe: France, Germany and United Kingdom together making up 75.5 MMT of EU-wheat production against only 24 MMT in Eastern European wheat - the combined amount from Poland, Romania, Bulgaria and Hungary. 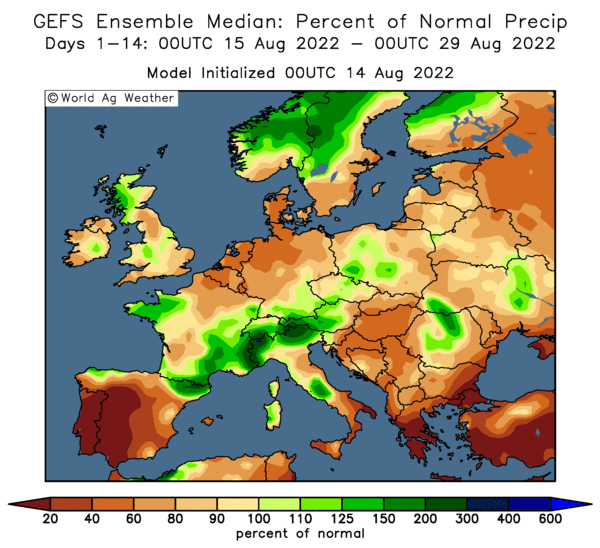 "Therefore, while Eastern European wheat potential is reduced relative to last season, the outlook for the European Union at large is better than a year ago," said Martell Crop Projections. Russia bought 25,110 MT of grains for it's intervention fund today, taking the total purchased so far this season to 510,570 MT - which is mostly wheat (84,915 MT is barley). IKAR said that Russia's 2013/14 grain exports currently include 11.4 MMT of wheat and 1.2 MMT of corn. Offers of 12.5% Russian milling wheat FOB the Black Sea are around $295/tonne, they say. Russia's Nov 1 grain stocks were up 10.3% on last year, with on farm inventories 27.8% higher, according to the Russian Ministry. Ukraine's Ministry say that 92% of winter grains are in good/satisfactory condition (the equivalent of 7.1 million hectares). The corn harvest there is now 99% complete at 29.897 MMT, taking this year's total grain output to a record 63.5 MMT they add. Tunisia are in the market to buy 134 TMT of durum wheat and 109 TMT of soft wheat. Jordan is in the market for 100 TMT of wheat as well. 16/12/13 -- Soycomplex: Beans traded lower in the overnight Globex session, but reversed that direction once the open outcry daytime trade began. Strong demand underpins the market, with the US having around 38.7 MMT (or over 96%) of the USDA's projected 40.1 MMT target for the 2013/14 either already shipped or sold and waiting to go (in roughly a 50:50 split). In addition forward sales for 2014/15 have also been unusually active too. Trade rhetoric suggests that much of the unshipped US soybean sales will end up getting cancelled or switched to South America. Today's trade gossip though has China supposedly actively seeking US beans for Feb shipment. The USDA also gave us another strong week of export inspections, with beans coming in at over 60.5 million bushels, versus trade expectations of 50-60 million. Cumulative inspections are now past halfway USDA expectations and we are less than a third of the way through the season. Domestic demand in the US is also strong, with the November NOPA crush coming in at 160.3 million bushels versus last year's 157.3 million. Brazil is said to be around 98% planted on beans, in line with normal. There's a little bit of talk of the weather turning hotter and drier in Brazil and Argentina. Jan 14 beans closed 10 1/4 cents higher at $13.37 3/4; Jan 14 meal was up $6.40 at $439.00 and Jan 14 soybean oil closed 8 points lower at 39.75. Corn: The corn market closed a couple of cents lower, extending the recent slide. Export inspections of only 25 million bushels weren't great, and fell short of trade expectations/hopes that they might at least match last week's 40 million. Despite the ongoing problems with China clearing US corn through customs, almost 9 million bushels of this week's total is heading that way. There are reports that some of these rejected US corn shipments to China are being shipped to South Korea at discounted prices. There's also talk of at least one cargo of US DDGS being quarantined due the same issue, and that the problem is unlikely to be resolved until well into the New Year. Speculation suggests that Beijing is using the dispute as a way to curb cheap corn imports and support the domestic market. They appear to have plenty of corn of their own, with a record crop of 217.7 MMT being forecast last week by CNGOIC, up from their previous estimate of 215 MMT and 6% higher than last year. Coceral estimated the EU-28 corn crop at 64.8 MMT, up almost 13% on last year. Ukraine revealed that it had exported more corn (7.45 MMT) than wheat (6.33 MMT) so far this season, a trend that is set to continue and a gap that's likely to get much wider by the end of 2013/14. News wires report that Mexico is to restore import taxes of 20% on white corn that were suspended in 2008. 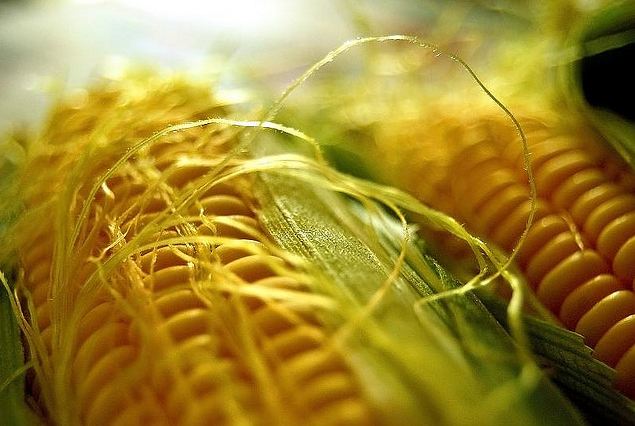 Yellow corn imports remain tax free. New front month Mar 14 corn closed down 2 1/4 cents at $4.23 1/4, within touching distance of the recent lifetime contract closing low of $4.21. May 14 closed down 2 cents at $4.31 3/4. Wheat: The wheat market slid to new lows, closing around 6-7 cents lower across the 3 exchanges. Demand for US wheat is what the market wants to see, and weekly export inspections of 17.5 million bushels were at the low end of trade expectations. Iraq's wheat tender, which closed over the weekend, picked up a best offer of just under $340 Ciffo for Australian origin material versus US wheat at a best price of almost $359 Ciffo. India continues to offer wheat in an attempt to make a bit of room ahead of another bumper, and maybe even record, harvest early in 2014. They reportedly picked up a best bid of $281.50 FOB in a 70,000 MT offering. Egypt's GASC is reported to have issued a late tender for wheat for Jan 21-31 shipment. France and Romania got the nod last week, although there's a feeling that offers out of the latter are about to dry up. Depressed corn prices offer little in the way of support to US wheat, and neither does Canada's record crop this year. Logistics appear to be their main hurdle to overcome. US winter wheat went into dormancy in pretty good shape, and so too has wheat across most of Europe - particularly in the western half of the continent where the bulk of the crop is grown. Mar 14 CBOT wheat closed down 7 cents at $6.21 3/4, a lifetime contract closing low. Mar 14 KCBT also ended 7 cents lower at $6.65 1/2 and Mar 14 MGEX wheat fell 6 1/4 cents to $6.54 1/4. 16/12/13 -- EU grains closed mostly easier, as US wheat fell to fresh lows. CBOT wheat closed at levels not seen since June 2012 on Friday, and declined further today. Jan 14 London wheat ended down GBP1.10/tonne at GBP164.30/tonne, and Jan 14 Paris wheat finished EUR0.50/tonne easier at EUR208.00/tonne, Jan 14 Paris corn closed EUR3.25/tonne lower at EUR172.50/tonne, whilst Feb 14 Paris rapeseed dropped EUR0.75/tonne to EUR366.50/tonne. Morocco bought 75 TMT of wheat on the domestic, not international, market over the weekend. Algeria booked 150 TMT of durum wheat (thought to be of Canadian origin) for Jan shipment. The lowest bid in Iraq's wheat tender that closed at the weekend was said to be of Australian origin. Otherwise export interest looks pretty scant. Ukraine said that they'd exported 15.9 MMT of grains in the 2013/14 marketing year so far to Dec 13. That includes 6,33 MMT of wheat, 7.45 MMT if corn and 1.98 MMT of barley, and represents a 22.3% increase on last year. Coceral finalised their forecasts for the 2013 EU-28 cereal harvest, placing the soft wheat output this year at 135.9 MMT, and increase of almost 8% on last year. The 2013 EU-28 durum wheat crop adds 8.24 MMT to that total, with barley production at 59.7 MMT (versus 54.4 MMT last year) and corn output coming in at 64.8 MMT versus 57.4 MMT in 2012. The Russian Ag Ministry said that this year's grain harvest was 96.4 MMT in bunker weight, or in excess of 90 MMT in clean weight. That compares to a clean weight harvest of 70.9 MMT a year ago. This year's harvest includes 50 MMT of wheat (in clean weight). They predict a 2014 grain harvest of 95 MMT in clean weight, including 55 MMT of wheat. Winter grain plantings however are only complete on 14.7 million hectares, 1.1 million less than a year ago. That is now likely to be that until the spring. The EU Commission's MARS unit said that "The decreasing temperatures of late autumn and early winter initiated the hardening of winter cereals. Our model simulation results indicate some delay in hardening in central and eastern areas of Europe due to the mild thermal conditions of the last two months." "Hardening is well advanced in southern Germany, the south-western half of the Czech Republic, as well as in northern Europe, most of Belarus, in the Central Okrug of Russia and some areas in northern and eastern Ukraine. Winter crops are partially hardened in a wide region extending from the British Isles and Spain to the Black Sea," they added. "Below-average temperatures are expected over southern Russia, Turkey and northern Africa, whereas warmer-than usual conditions will prevail in a wide belt extending from the British Isles to the central part of Russia. Frost kill is unlikely to occur during the forecast period. 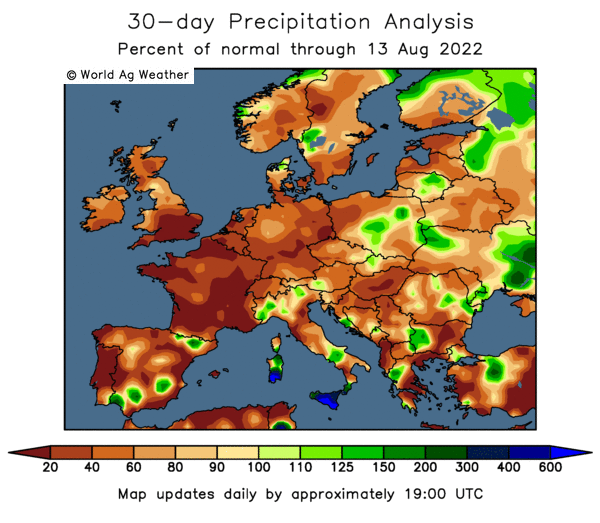 Most of Europe is expected to remain drier-than-usual, with the exception of the British Isles, southern Scandinavia, Denmark, southern Finland and the north-western part of the Iberian Peninsula," they noted. 13/12/13 -- Soycomplex: Beans closed with modest gains, just about managing to shake off tumbling wheat and corn. Ultimately nothing much has changed for beans, we still have very strong nearby demand for US beans supporting the market, but the negative influence of the prospect of record crops to come from South America getting ever closer. Oil World forecast the 2013/14 South American soybean crop at 159.8 MMT, up 10% versus last year and compared to their previous estimate of 158.5 MMT. Brazil will account for 89 MMT of that, along with a further 55.5 MMT from Argentina, they predict. That puts them in the middle of the range of popular trade estimates. The Buenos Aires Grains Exchange said that Argentine bean planting is almost two thirds complete. There's some speculation that the ongoing problems with some US corn shipments to China containing traces of a non-approved variety might lead to increased scrutiny, and therefore shipping delays, for US beans too. Independently of that there's the ever-present gossip that some of the outstanding US soybean sales will ultimately get switched to South America/cancelled. The USDA currently projects 2013/14 US soybean exports at just over 40 MMT, of which 19 MMT has already been shipped and a further 19.7 MMT is on the books waiting to go. Shipments have averaged 2 MMT/week over the last 6 weeks, so in theory all of the outstanding sales could be shipped in the next 10 weeks, or by the end of February, if things hold up at these levels. That's a fairly substantial IF, but one that doesn't make allowances for further sales between now and then, or the almost inevitable switching back to the US once the perennial Brazilian shipping delays start getting out of hand. Nevertheless the outlook for prices is certainly bearish longer-term, especially with US growers expected to mimic their South American compadres and significantly increase soybean plantings in the spring. Rabobank forecast 4th quarter 2014 US soybean prices to average at $10.70/bu, versus tonight's close on Nov 14 of $11.57 3/4. Jan 14 Soybeans closed the day at $13.27 1/2, up 3 3/4 cents; Mar 14 Soybeans closed at $13.13 3/4, up 2 1/4 cents; Dec 13 Soybean Meal closed at $462.90, up $3.50; Dec 13 Soybean Oil closed at 39.47, down 33 points - less than 40 points away from the lowest close for a front month since July 2010. Corn: The corn market closed sharply lower as the dispute between China and the US over MIR 162 corn shows no sign of letting up. In fact it's getting worse. Yesterday's export sales report showed a further 370,700 MT of US corn heading for China, with seemingly little assurance that it will get through customs clearance when it gets there. Trade talk suggests that China’s strict checking for this unapproved strain of US GMO corn will continue into early next year. One trade commentator told Reuters that he didn't see any approval for MIR 162 happening until after the Chinese New Year festival in February. Some news services are now reporting that the problem has spread to DDGS, with some reports suggesting that traces of MIR 162 have been found in at least one such shipment, leading to fears that they could also start rejecting DDGS cargoes too. CNGOIC said that China's 2013/14 corn crop was a record 217.7 MMT this week, and that domestic consumption was likely to be over 20 MMT less at 197 MMT. Consider too that the reason that China has been buying more wheat than previously for 2013/14 is due to the relatively poor quality of it's 2013 harvest. That low grade surplus wheat is likely to replace some corn in Chinese feed rations. The Buenos Aires Grains Exchange said that corn plantings in Argentina are 55.5% done versus 60% a year ago and 47.7% a week ago. Rabobank forecast that 4th quarter 2014 US corn prices will average $4.10/bushel versus tonight's Dec 14 close of $4.52 1/2. Taiwan Sugar Corp bought 23 TMT of US corn in a tender yesterday. A group of 10 US senators proposed a bill to eliminate the 2014 ethanol mandate yesterday. Whilst most think it unlikely that the bill will get passed, it is nevertheless unsettling for the corn market given the fact that the US has a record large crop to shift, and it's probably only domestic demand from the ethanol industry that's stopped prices falling below $4/bu up until now. Factor in the ongoing problems with China and the only thing that corn has got going for it right now is the anticipated continued unwinding of fund short positions heading into the year end to keep the market from falling further. What will the new year bring? Some think new lows. Dec 13 Corn closed at $4.20 1/2, down 7 3/4 cents; Mar 14 Corn closed at $4.25 1/2, down 8 3/4 cents. Wheat: Wheat fell particularly sharply on front month Dec 13 in both Kansas and Minneapolis, although note that the Dec 13 position went off the board on all three exchanges today. Even so, wheat was down around 3-6 cents on most other months too. Dec 13 Chicago wheat meanwhile went off the board at the lowest levels for a front month since just before the big price spike of the summer of 2012 when it became apparent that all was not well with the crop in Russia. Talk that India plans to move around 2 MMT of wheat onto the world market in the next two months ahead of their 2014 harvest adds to the bearish tone at the moment, despite buoyant EU sales. US wheat also faces stiff competition on the world export market from Europe, where we have a distinct price advantage into North Africa and the Middle East, due to freight considerations. There is also the threat on their own doorstep of this year's monster Canadian crop. Canadian wheat exports Aug 1-Dec 5 were up 26.5% on the same period in 2012, according to customs data. With a record 37.5 MMT crop to market, according to both Stats Canada and the USDA, they are likely to remain aggressive sellers right the way through until harvest 2014. We've already seen a significant shift away from US wheat and into Canadian origin from Japan lately. Australia's wheat crop also seems to be getting larger, and they and Canada are expected to slug it out in an Iraq wheat tender that closes over the weekend. The Buenos Aires Grains Exchange said that the Argentine wheat harvest is almost 40% complete, and stood by their forecast for a crop of 10.35 MMT this year. There's talk that Brazil bought one cargo of US HRW wheat this week, but that offers little bullish input. The cold snap that has gripped the US recently is seen giving way to much milder conditions in the week ahead "Temperatures in the High Plains are warming up. Moderating temperatures are predicted the next several days as a warm ridge of the high pressure builds into the southwestern United States. Well above normal temperatures are predicted the next several day on the High Plains. Wheat areas in Kansas would warm up into the mid and upper 50s by Monday, the moderate temperatures expected to persist most of next week. Growth in winter wheat is not expected, as the warm-up would not last long enough to coax wheat out of dormancy," said Martell Crop Projections. Dec 13 CBOT Wheat closed at $6.18 1/4, down 4 1/4 cents; Dec 13 KCBT Wheat closed at $6.57, down 12 1/4 cents; Dec 13 MGEX Wheat closed at $6.42 1/4, down 10 cents.